March 1-April 30 Women Artists of the West online Spring show. May 2019: Camano Island Yacht Club Solo Show. Opening reception TBA. The show runs the whole month, but be sure to stop by during the Camano Island Art Studio Tour, Mother's Day Weekend, and the Encore show on May 10-12 and 18-19, food and beverages will be offered free to guests 10am to 5pm both weekends. August 1-31: Fairweather House & Gallery in Seaside, OR. Group show “Outside Interests.” Opening reception Saturday August 3 5-7pm. April 1-30: Skagit Valley Tulip Festival appearances. Please visit the SVTF website for more information. December 12-23: Dorsey Fine Art Gallery on Camano Island, WA. “Twelve Days of Christmas” small works show. October 21-22: Wine and Art at Molbaks in Woodinville, WA. Wine tasting and art show with awards reception Saturday October 21 4-8p. Art will also be up for viewing Sunday October 22 from 11a-4p. November 14: Skagit Valley Gardens in Mount Vernon, WA: Skagit Valley 2018 Tulip Festival Poster Unveiling. November 19: Goose Ridge Winery in Woodinville, WA: Holiday Small Works Show. Sunday Nov. 19 from 11am to 7pm. 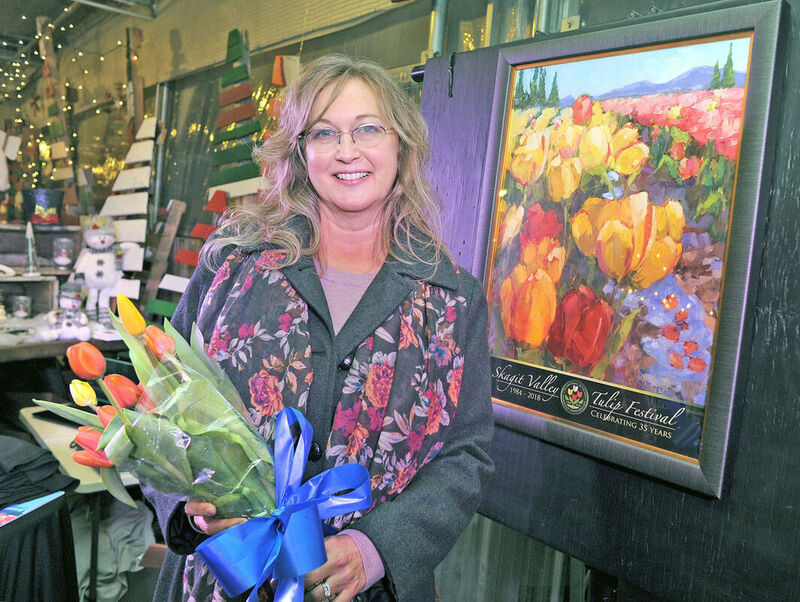 "2018 ...Poster Art Created by Woodinville Artist..."
"The official 2018 Skagit Valley Tulip Festival poster by artist Melissa Jander..."
"Announcing the 2018 Tulip Festival Poster Artist..."
"...Jander has found a vision..."